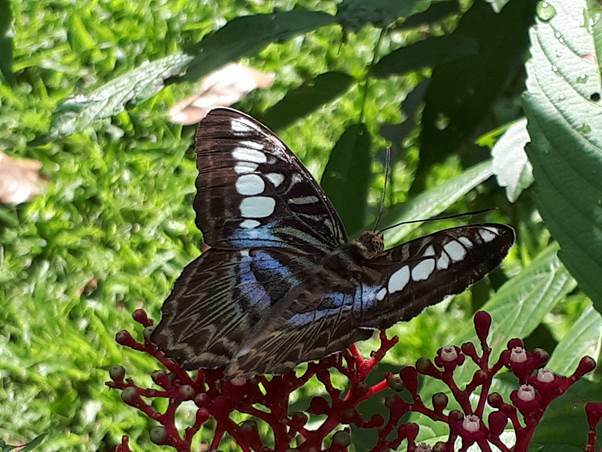 This morning at Khoo Teck Puat Hospital's Medicinal Garden, Mr. Simon Chan spotted the Clipper (Parthyienos sylvia lilacinus) butterfly feeding voraciously on Red Leea (Leea rubra) flowers. It was so focussed on dining that Simon managed to get very close for a few shots using his handphone. This medium-sized species is reported to be locally extinct since the early 1990’s. Although, there have sporadic sightings from urban parks and wooded areas in the past 5 years. It was a pleasant surprise to see it here again at KTPH!